Dinner, Dancing, Countdown Toasts, Fireworks! 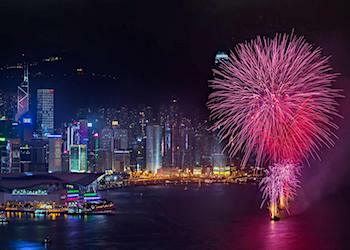 There is no shortage of outstanding hotels in Hong Kong to welcome the New Year in style. Whether you want to party the night away or just enjoy the magnificent fireworks display from the comfort of your own room, there are plenty of options to choose from. There will be plenty of parties, banquets, toasts and celebrations at the hotels and a wide variety of themes and styles. 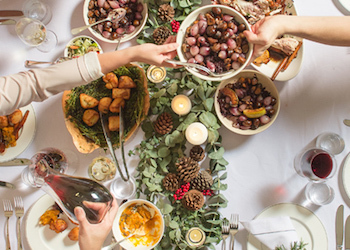 You can expect hotel rates to skyrocket during the holiday season. For the best deals and choices try to book as early as possible. If your aim is to have the fireworks in view from the comfort of your own room, be sure to reserve a Harbour View room. 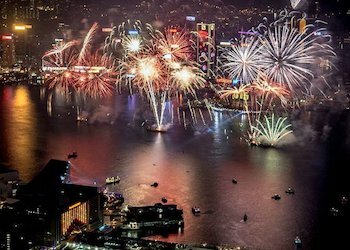 Here are some top hotels in Hong Kong, they are not only top choices to stay, they will certainly go all out this New Year's Eve, here are the offerings they bring! Ring in 2019 at the Mandarin Oriental's New Year's Eve party at the M Bar. 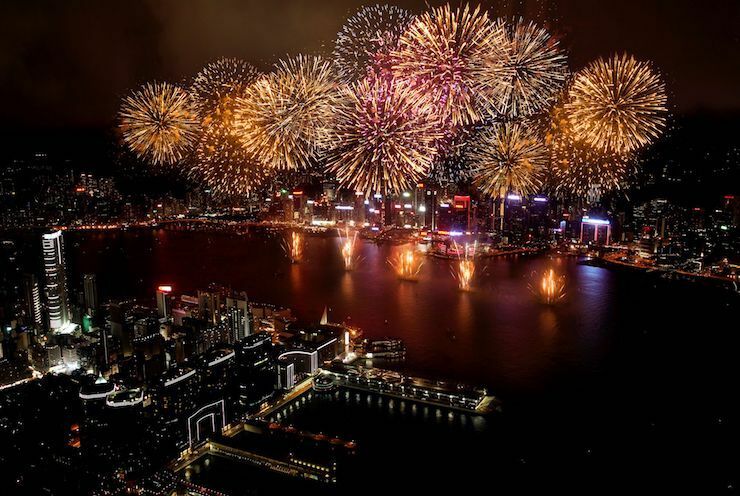 Celebrate with a live DJ performance, breathtaking views, and sip bubbles as the city sky lights up with Hong Kong's famous fireworks display. Ritz Carlton Hong Kong is the world's highest hotel. Located between the 102nd and 118th floors of the ICC building, the tallest skyscraper in Hong Kong, it offers incredible views and panoramic surroundings of all the holiday glitz that envelopes the harbour this time of the year. Goes without saying, you will have a front row seat to the fireworks from many of the Ritz Carlton restaurants and venues. Upper House is part of the "House Collection" of Swire Hotels, a handful of uniquely designed small luxury properties that strive to provide a distinctive and highly individualised experience. The hotel is located above Pacific Place, you have fantastic views and easy access to world-class shopping and dining, the Admiralty MTR station, and the business district. This year's menu includes Cold Smoked Mount Cook Salmon Fleurettes starter, Double Boiled Tea Tree Mushroom Consomme, King Crab Claws and Lobster Ragou, Roasted Barbary Duck Foie Gras Emulsion served with Merlot braised red cabbage or Braised Wagyu Beef Cheeks and Seared Filte Mignon served with creamed truffle spaetzli and caramelized root vegetables, and to finish it up, Marinated Raspberries "Kir Roayale" or Chocolate Marquise with Williams Pear in Stracciatella ice cream. InterContinental Hong Kong, with its dramatic Kowloon waterfront location, always provides a spectacular setting for the holidays. Enjoy the breathtaking panoramic views of Hong Kong Island with its kaleidoscope of Christmas lights and New Year's Eve Fireworks, as the dramatic backdrop for holiday dining in the five stylish restaurants and stunning Lobby Lounge. This year, the hotel's fantastic holiday programme includes special Christmas Eve & Day and New Year's Eve & Day menus in all of the restaurants. 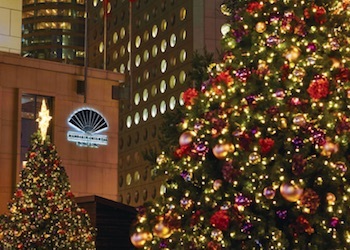 The Marco Polo offers a fantastic location in Harbour City, Hong Kong's largest shopping center of legendary Christmas displays fame. The hotel also offers superb views of the world's most dramatic waterfront and is one of our top picks for the legendary fireworks. On New Year's Eve, Cucina will be hosting a DJ and live performances from a drumming group, with a free-flow of selected Prosecco, wines, beer, spirits, soft drinks, juices and canapés to usher in a sparkling New Year! The Pen is the legendary "Grande Dame of the Far East" and oldest hotel in Hong Kong. 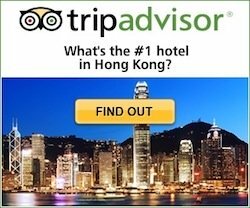 Located in the heart of Tsim Sha Tsui this hotel is perfectly situated for taking in the Holiday lights and the magnificent fireworks at midnight. Service at the Peninsula is over the top, and come holiday time, it won't dissapoint. 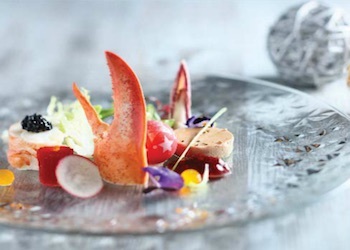 All of The Peninsula's restaurants will be celebrating the New Year with special menus. The celebrations begin with cocktails at 7:30 pm at the forecourt. Dress is Black Tie. ›› Stay at the Pen, reserve a harbourview room or suite! The Harbour Grand is one of our top hotels for fireworks viewing. 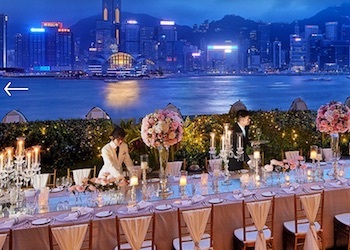 Its location in North Point in Hong Kong Island boasts a 270-degree view of the Victoria Harbour skyline. In addition, the hotel is only 5 minutes walk from Fortress Hill MTR station and within easy reach. On New Year's Eve, Skyline Pavilion (subject to weather conditions) at the rooftop is the best vantage point to to embrace the magnificent harbourview and Fireworks display and will be exclusively open for all in-house registered guests and diners to enjoy the spectacular fireworks show to welcome the new year. 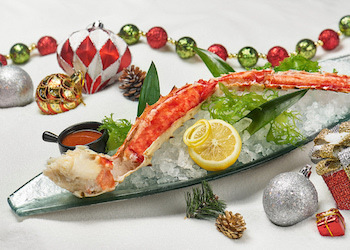 The festive programme extends to each of the signature restaurants at the Harbour Grand, with Lunch and Dinner buffet and set dinners on New Year's Eve and New Year's Day starting at HK358 per person.